Danse Macabre series is one of the most loved and cherished HOPA series from Eipix Entertainment. The new release, Danse Macabre: A Lover's Pledge Collector's Edition is going to please the fans of the series with all the drama and the beauty it is surrounded with. The story is neither your typical cheesy love story nor a frightening monster-filled horror story. Once you choose your mode of difficulty or make your own with the customizable settings, you are good to go! Nonetheless, the story is filled with sad events surrounding a couple's love and there plenty of ghostly presence lurking around the corner. You are going to slowly reveal one piece of the story after another. You play as a costume master at a theatre and you learn about the main actress and her sister a lot as you try to rescue her and find out what the ghost wants. While you try to figure out who is trying to hurt the actors and why you go to different parts of the theatre, stage, backstage, dressing rooms etc... All of those carry quite an atmosphere with them. Beautiful decorations, the lights, and just the normal theater paraphernalia paired with beautiful music make it quite an enjoyable experience. Once you choose your mode of difficulty or make your own with the customizable settings, you are good to go! 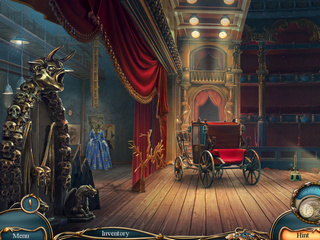 The hidden object scenes and not very numerous in this game, but they do show some thought and art. Some of the HO scenes are visited twice and most of them don't have a very long list of items that you need to find. The mini-games come in different difficulty levels and you can expect a couple of rather challenging later on in the game. 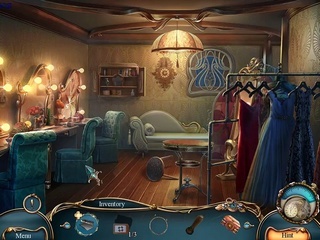 Both HO scenes and mini-games are offered for replay. There is a bonus chapter where you help two lovers escape a danger. You need to pay attention to collectibles and you can ear quite a few achievements. There are a souvenir room and a whole lot of media extras. Unfortunately, Danse Macabre: A Lover's Pledge Collector's Edition doesn't have any morphing objects. 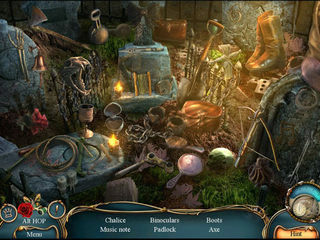 It is a wonderful hidden object puzzle adventure game to play without being scared along the way! This is Danse Macabre: A Lover's Pledge review. Download this game here.